Starting with v16.2.0.x, if you refer to Syncfusion assemblies from trial setup or from the NuGet feed, include a license key in your projects. Refer to this link to learn about registering Syncfusion license key in your ASP.NET Core application to use our components. This section covers the information that you need to know to populate a simple PivotClient with OLAP data completely on the client-side. Create a new ASP.NET MVC Web Application using Visual Studio IDE and name the project as “PivotClientDemo”. Select the View engine as ‘Razor’ and Project template as ‘Internet Application’ and finally click OK button to create an application. Now add the following dependency libraries as references into your MVC Web Application. In order to add them to your application, right-click on References in Solution Explorer and select Add Reference. Now in the Reference Manager dialog, under Assemblies > Extension, the following Syncfusion libraries will be found. Register the referred assemblies in “Web.config” files available inside Views folder and also at the root of the application. Register the required namespaces in “Web.config” files available inside Views folder and also at the root of the application. Registering assemblies and namespaces earlier helps to include the control in view page with the help of intellisense. Scripts and style sheets are referred under the <head> tag in _Layout.cshtml file which is found inside Views > Shared folder. The script manager is initialized immediately after the RenderBody() function call in _Layout.cshtml file in-order to generate control related scripts. Before initializing, empty the contents of Index.cshtml file under Views > Home folder and add the following codes. Initializes the OLAP datasource for PivotClient control as shown below. 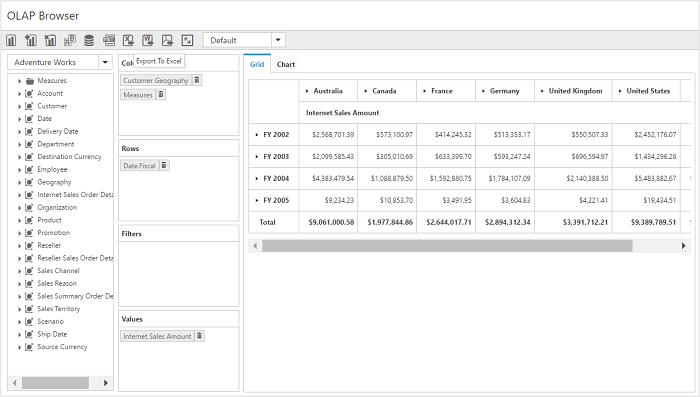 Now, PivotClient is rendered with PivotChart and PivotGrid with “Customer Geography” field in Column, “Fiscal” field in Row and “Internet Sales Amount” field in Value section. This section covers the information required to create a simple PivotClient bound to OLAP datasource. ASP.NET MVC Web Application will contain a service that transfers data to server-side, processes and returns back to client-side for control rendering and re-rendering. The service utilized for communication could be either WCF or WebAPI based on user requirement. If you have installed any version of SQL Server Analysis Service (SSAS) or Microsoft ADOMD.NET utility, then the location of Microsoft.AnalysisServices.AdomdClient library is [system drive:\Program Files (x86)\Microsoft.NET\ADOMD.NET]. And if you have installed any version of Essential Studio, then the location of Syncfusion libraries is [system drive:\Program Files (x86)\Syncfusion\Essential Studio\17.1.0.38\Assemblies]. Register the referenced assemblies in “Web.config” files available inside Views folder and also at the root of the application. Click here here to know more about scripts and style sheets available online (CDN Link). Scripts and style sheets are referred under the head tag in _Layout.cshtml file which is found inside Views > Shared folder. Before initializing, empty the contents of Index.cshtml file under Views > Home folder and add the following codes. Register the namespaces at the top of the page and then add the control. The “Url” property in PivotClient control points the service endpoint, where data are processed and fetched in the form of JSON. The services used in PivotClient control as endpoint are WCF and WebAPI. The above “Index.cshtml” contains WebAPI URL, which is “/Olap”. If WCF service is used as endpoint, the URL would look like “/OlapService.svc”. To add a WebAPI controller in an existing Web Application, right-click on the project in Solution Explorer and select Add > New Item. In the Add New Item window, select WebAPI Controller Class and name it as OlapController.cs, click Add. Now, WebAPI controller is added to the application successfully with the file “OlapController.cs”. While adding WebAPI Controller Class, name it with the suffix ‘Controller’ that is mandatory. For example, in this demo the controller is named as “OlapController”. Next, remove all the existing methods such as “Get”, “Post”, “Put” and “Delete” present inside OlapController.cs file. The following are the list of namespaces to be added on top of the main class inside OlapController.cs file. Define the service methods inside “OlapController” class, found inside OlapController.cs file, created while adding WebAPI Controller Class to the Application. Open the “WebAPIConfig.cs” file found in App_Start folder. Then routing could be configured as shown in the following code example. 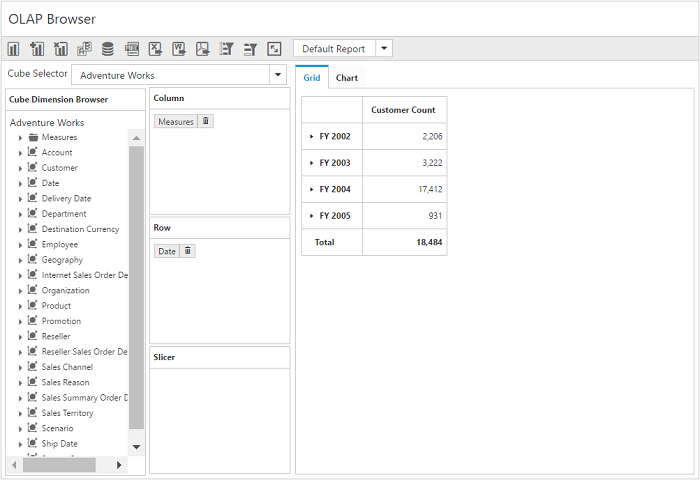 Now, PivotClient is rendered with PivotChart and PivotGrid showing Customer Count over a period of fiscal years. This section demonstrates the utilization of WCF service as endpoint binding OLAP datasource to a simple PivotClient. For more details on this topic, click here.